Yellow fever, a deadly scourge transmitted by mosquitoes that has impacted the course of human history time and time again, is on the rise in Latin America. The first yellow fever death in Brazil in 17 years occurred in January 2017, when a young person who worked in the jungle succumbed to the disease. A recent Pan American Health Organization (PAHO) “Situation summary in the Americas” reported that since the current outbreak began in Brazil in December 2016, there have been over 1,400 confirmed or suspected cases and at least 234 deaths in six states of that country. Suspected and confirmed yellow fever cases have also been reported in Colombia, Ecuador, Peru, Bolivia and Suriname. Yellow fever is indigenous to some tropical regions of Central and South America and Africa, and is caused by the yellow fever virus, one of a family of Flaviviruses, which includes West Nile virus, dengue virus and Zika virus. “Flavus” is Latin for “yellow.” Because it is borne by an arthropod (mosquitoes are arthropods), it is also known as an “arbovirus.” Yellow fever is the most severe arbovirus ever to circulate in the Americas, according to a recent commentary in The New England Journal of Medicine (NEJM). The yellow fever virus is transmitted through both a sylvatic (jungle) cycle and an urban cycle. According to the PAHO “Control of Yellow Fever Field Guide,” in the sylvatic cycle, the virus circulates among primates, primarily monkeys, through the bites of several species of mosquitos, and may result in death (see photo below). In the Americas, in the urban cycle, the virus is circulated among humans through the bite of the Aedes aegypti mosquito, the same mosquito that transmits Zika virus, chikungunya and dengue fever. 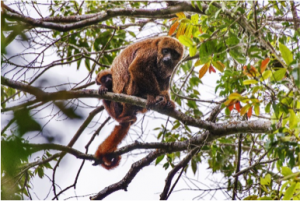 According to a recent Science Daily report, thousands of brown howler monkeys in a forest in southeastern Brazil have died of yellow fever. The urban cycle is initiated when a person who was infected with the disease in the jungle enters an urban center in which there is a high density of A. aegypti mosquitoes. If that individual is bitten by the A. aegypti mosquito while the virus is circulating in his or her blood, the disease can be spread to others subsequently bitten by the same mosquito, setting off a chain of transmission. Large outbreaks can result in urban areas where there are high mosquito densities and a high percentage of unvaccinated or otherwise unimmunized people. So far there is no evidence of urban transmission in Brazil. Following infection, the virus incubates in the human body for three to six days. Although many people develop no symptoms at all, fever, headache, jaundice, muscle pain, nausea, vomiting and fatigue may develop. Yellow fever is named for the jaundice exhibited by some patients. According to the World Health Organization, a small fraction of people infected with yellow fever develop severe symptoms and of those, approximately half die within seven to ten days. Fortunately, a very effective vaccine for yellow fever was developed in 1937 that is in wide use where the disease is endemic. According to the NEJM commentary, the current outbreak in Brazil is precariously centered in areas close to urban centers. Because urban Brazilians are not typically vaccinated against yellow fever, there is a concern that widespread urban transmission could begin, which could lead to “travel” cases in the US, such as we have seen with dengue, chikungunya and Zika viruses. Local US transmission can become a potential issue in regions such as the Gulf Coast states where A. aegypti mosquitoes thrive. In the age of world travel, we are a connected community, and with increasing tourism into jungle areas, the risk of importing yellow fever grows more likely. As we know from recent experience with Zika virus, controlling the mosquito vector is a significant strategy for avoiding arboviruses. This includes removing outdoor standing water, properly chlorinating backyard swimming pools, maintaining window and door screens, and applying mosquito repellent appropriately (see tips). These are solid precautionary measures we can all take to help avoid any of the potential arboviruses circulating in our midst. Travelers to yellow fever endemic areas should ensure that they are immunized for yellow fever. Recently CDC announced a shortage of yellow fever vaccine, but noted there is a plan for providing safe vaccine at a limited number of clinics until the supply is replenished. For updates on the vaccine’s availability, please consult the CDC Travelers’ Health website. Travelers to areas in which yellow fever is endemic can also consider using bed netting, wearing protective clothing and applying mosquito repellent. The more things change, the more they stay the same. Yellow fever is back (it never really went away), but unlike the devastating outbreaks documented throughout history, we now have proven effective measures to preclude them … if they are utilized.